About St Georges Lane On entering into St Georges Lane you are transported back to the early 1970’s. 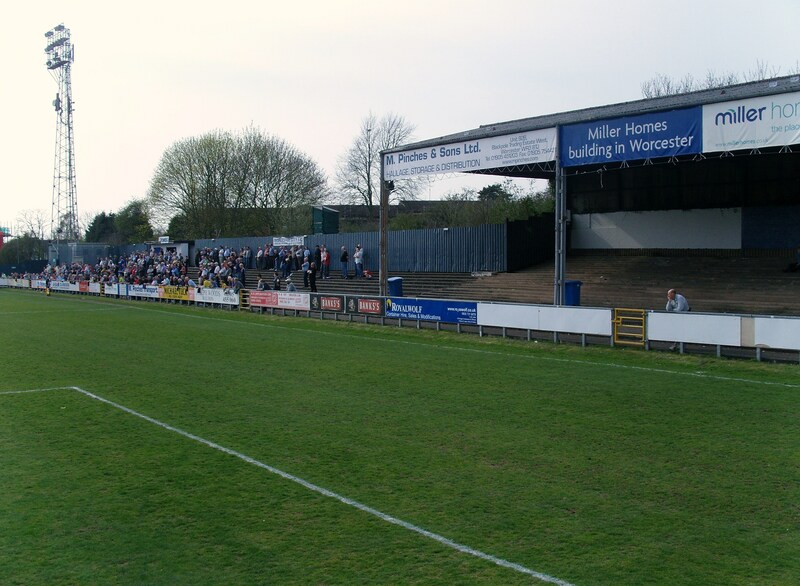 One main stand with a small terrace in front of it, a large bank of terracing on the far side, part of which has a roof and terraces behind the goals. Basic it is and certainly not build for comfort but the proposed move to the new ground will change all that. However in the meantime expect to get cold and wet if you come here in the winter, although on a sunny day it makes for pleasant viewing, especially in the unusual terrace behind the goal which is at cross bar height meaning you can look down on the action. The bar seems to run almost the whole length of the main stand and is a great place for a pre, during and post match drink. How to get to St Georges Lane Leave the M5 at Junction 6 (Worcester North) and follow the signs towards Worcester along the A449. Follow the dual carriageway till you come to a roundabout. Take the 2nd turning towards Worcester. Stay on this road (Ombersley Road) for about a mile until you reach a T-junction and traffic lights. Take a right turn at the T-junction, St. Georges Lane North is the third turning on the left between a tool hire shop and the In-Toto kitchen showrooms. As you travel up St. Georges Lane you will see the floodlight pylons of the ground, follow the road until you reach the front of the ground, very prominent. Car parking is roadside only, it is best to carry on past the front of the ground over the canal bridge and up Merrimans Hill road and park on the side of this road. From Worcester Foregate Street Station. Exit via the long flight of steps and turn right onto Foregate Street. Proceed along this road past the Shirehall, Alice Ottley School and Royal Grammar School until you reach St George’s Lane you will see the floodlight pylons of the ground, follow the road until you reach the front of the ground, very prominent. Total distance is about one mile. From Worcester Shrub Hill Station. Its probably best to get a Taxi from here but if you want to walk leave the station and proceed ahead over the brow of the hil towards Pizza Hut. Cross the footbridge and walk along the canal tow path (you can only go one direction). Continue in this direction along the tow path until you reach the Cavalier Pub, turn left and you will see the Entrance to the ground in front of you. Total distance is about two miles. 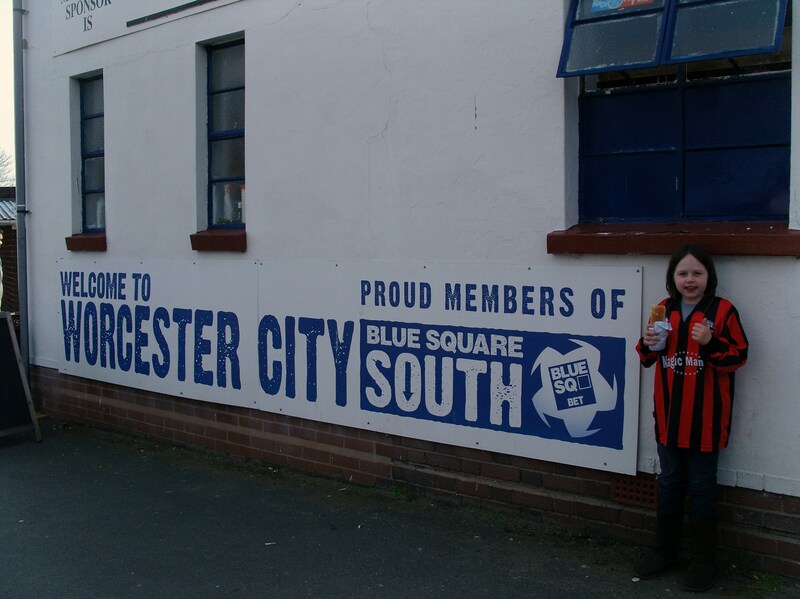 How to get a ticket for St Georges Lane Admission prices to Worcester City for season 2009/10 will be: Ground: Adult £11, Concessions £7, Children (under 16) £3, Stand transfer £1. The club has some special deals running for certain games such as children going in free with any adult. Last Visit – April 2010 Ask the average man (or woman) in the street anywhere in the UK apart from in a WR postcode what is the name of the Lea & Perrin spicy sauce you can chuck on your food and I bet 90% will answer “Worcester Sauce”. Well saying such a thing in or around the cathedral city of Worcester could get you put inside (not literally of course…you need to do something much more serious in Brown’s Britain for that privilege, such as putting rubbish in the wrong bin). For the answer is WorcesterSHIRE sauce. First made in Broad Street, Worcester by two chemists (John Wheeley Lea and William Henry Perrins) back in 1837, and is still being produced by HJ Heinz in the city. So what has that got to do with football? Well nothing really – it’s just that I like it on my food and I thought I would share it with you. Is there anywhere more English though than Worcester? Home of Edward Elgar and also St Georges Lane where it is rumoured the last remaining dragon lived and was hunted down by our patron saint. It has a rugby team, a county cricket team and of course the football team. Just down the road was where Cromwell’s New Model Army (who a few centuries later released the album Impurity) beat King Charles (pretending to be a dog) to win the Civil War (so called as they didn’t actually fight each other they just traded mild insults). During World War II Churchill was based just up the road, as it was decided that the city was far enough away from a potential German invasion and as they cannot pronounce their “W’s” properly and undercover attempts to locate him would have been rumbled – “Vere is Vorcester?”. And that is why the whole TBIR team had made their way across country on a glorious April Saturday wearing our red and black roses. So Worcester City – what a mixed situation they find themselves in. Six weeks ago the club looked doomed. Three nil down with fifteen minutes to go away at relegation rivals Lewes they stared demotion to the Southern League in the face and with uncertainty over the future of the ground things looked bleak. Then fifteen minutes of magic started a chain of events. Three goals in that period not only gave them a point, but in the context saved them three, and since then two further wins and two draws have put some breathing space between themselves and the final relegation spot, still occupied by Lewes. Last weekend the whole situation was turned on its head again with Lewes winning and Worcester losing, meaning that this game was a real six pointer. Add to this the off the field news for the relocation of the team from their St Georges Lane ground that has seen so many sights in its 108 year history but is now showing its age. The finest moment at the ground, and in fact in the club’s history must have been events on the 15th January 1959 when the then Birmingham League team beat Liverpool (then in the 2nd division) 2-1 in the FA Cup 3rd round. Drawn at home in round four they lost 2-0 to Sheffield United in front of a record 17,000 crowd. How can you top such an event? Well you can’t and the club has been dining out on the fact that they have beaten a five times European Cup winning team since. I once met a Worcester City fan who tried to explain to me that the club were in fact the World Club Champions. After all they had beaten Liverpool, and Liverpool had beaten Manchester United, and Manchester United had beaten Real Madrid who in turn won the first ever Intercontinental Cup which then became the FIFA Club Championship. 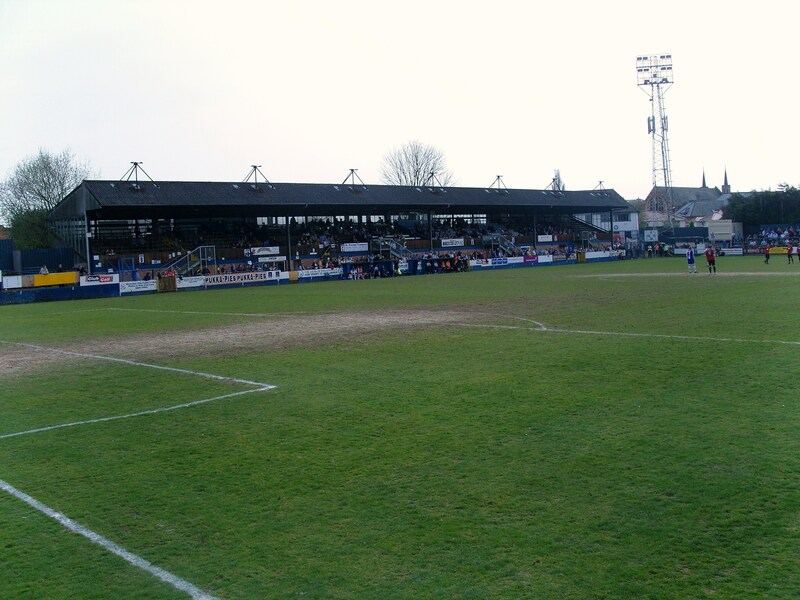 After a long stint in the Southern League, including a season under the stewardship of Ronnie Radford, he of THAT Hereford United goal in 1971 they were one of the original clubs to form the Alliance Premier League (today the Blue Square Premier) where they stayed until the mid-eighties. Two seasons ago they moved from the Blue Square North to South to balance up the numbers and have struggled this season at the bottom of the league with crowds falling about 10% from last season. Inconsistency has been the only constant this season. Some great wins against the likes of Dover (home and away), Woking and Dorchester have been balanced by defeats to already relegated Weston-super-Mare and Weymouth. The TBIR team met up with Cynical Dave and Big Deaks who can boast an almost 100% attendance record this season. Dave certainly has been there through thick and thin and wasn’t looking forward to the prospect of away games at Aveley, Canvey Island or Hornchurch on a wet Tuesday night (although Hastings United and Margate on a sunny day in August is a different story) if relegation did come to Lewes. Unfortunately Danny had decided that this game wasn’t bit enough for him so had headed over to Madrid for the small matter of Real v Barcelona. Me myself had turned my back on the Circus again, choosing this relegation battle rather than the one at Upton Park. This was the longest away trip of the season and through the bizarre workings of the non league authorities Worcester is actually some 30 miles north of Gloucester who play in the Blue Square North. We sent off at 10am and shortly received a mercy call from the Lewes Lunatic Fringe who were stuck at Reading so we diverted there scooped them up after negotiating some of the worst signage known to man and made our merry way up to Worcester. After passing Sixways, home of Worcester Warriors sitting in the middle of erm…nothing…we headed on down to the ground and got a spot right outside the entrance, and opposite the Cavalier pub. Let me describe the setting for you. Benches beside a canal, sun shining, big tattooed bloke sitting outside with a huge pitbull, three yoofs listening to tinny music on their mobile phones – can a pub scene be any more English than this? We passed on the Cavalier and instead went round the corner to the Swan for a pint of London Pride and Marston – “the beer of England” the glass told us. All we needed was a man in a bowler hat with a copy of the Times to walk past to complete the scene. Instead we saw/heard a Polish/Slovakian/Serbian couple, complete with 18 children wander past throwing their crisp packets on the floor – Can it get any more English than that! It was game time, and after hearing some revelations about the Lewes goalkeeper’s latest girlfriend (I cannot reveal it here – suffice to say that it is a close female relative of someone who epitomizes the current English cultural scene) we paid our entrance fee and were in. Immediately we were thrust a voting slip for Worcester City’s player of the year – all of us except Lolly, who sporting her Lewes shirt was immediately excluded. As a protest to such apartheid Dave, Deaks and myself cast votes for Julian Dicks! Another record was set prior to kick off as we counted no less than 11 different team/country shirts in the bar. Arsenal, Liverpool, Man Utd, Chelsea, Derby County, Birmingham City, Aston Villa, Wolves, Barcelona, England and El Salvador (OK so the last one was mine but it still counts) – hardly a show of solidarity for the home side! Worcester City 1 Lewes 2 – St Georges Lane – Saturday 10th April 2010 488…488…Four hundred and eighty eight days have passed since Lewes last won on the road in the League. Tuesday 8th December 2008 was the date. The place, Salisbury City but all of that has now been consigned to the bin as the Rooks won their most important game of the season. It was tense, it was nervous and it gave everyone a headache but after 97 minutes when the referee eventually blew his whistle, the 23 Lewes fans could rejoice in the knowledge that for the first time in weeks the club’s fate was in their own hands. With two games in hand and just two points now separating the teams the “great escape” could be possible. The match started relatively slowly, with the Worcester fans standing on the terraces urging their team on, but it was Lewes who made the early running. The first real chance fell to Joe Keehan who headed a glorious chance wide in the 15th minute, and then David Wheeler smashed his header against the bar with Worcester’s keeper completely beaten. Lewes didn’t have to wait too long for their reward though as in the 22nd minute a long Rikki Banks punt upfield was flicked on and Rob Gradwell outpaced the defence and slotted the ball passed the on coming keeper. The rest of the half saw Lewes confidently playing the ball around and pushing forward, content in taking a half time lead. The Worcester fans had seen enough and started filtering past us on their way to the bar. One stopped and asked “Are you called Lewes or Looes?” . A smart retort of “Are you called Worcester or Whorsester?” moved him onwards as he had lost his bet with his mates about the pronunciation and was seen shortly after buying a round of Aftershock in the bar. But then one of those rare moments at football stunned everyone. Another long punt upfield. Keeper and Defender both go for the same ball and both miss it and Steve Brinkhurst simply tapped the ball into an empty net. One for the Danny Dyer/Ricky Tomlinson/Nick Hancock etc Xmas DVD I am sure. As with tradition in the non leagues we swapped ends at half time, wandering around the ground. It has certainly seen better days and if you ever wanted to make a film about football in the 1960’s or 1970’s then St Georges Lane is the place to come. You can understand why the club are so desperate to move to a new ground. The terrace behind the goal where we were now standing was a classic example. Unusually set high above the goal, but close enough to reach into the net – it would have been a crime not to set up our own “Backofthenetcam” – a great idea but in practice almost completely redundant as all the action was at the far end as Worcester battered Lewes from the first whistle. They hit the bar within the first 60 seconds of the half and if it wouldn’t have been for a brilliant Rikki Banks re-action save midway through the half the end result would have been different. As it was Matt Birley’s headed goal in the 76th minute was their only reward. With 4 minutes of injury time being played Lewes took the age old tactic of taking the ball into the corners. Nothing wrong with that – or was there? Every time they did it the referee shouted “get out of the corners”. Now I know that some people are football purists but this is taking it to the extreme. Sorry ref but you do not decide how the game is played. So three valuable points from a highly entertaining away day. We resisted the urge of a quick pint in the Cavalier as the man with the dog had been joined by a bigger man with a bigger dog and instead got back on the road down south. Days like these are few and far between but that is what makes England great. For more pictures from our day out in Worcester, click here.